This painting is about the power of dreams. 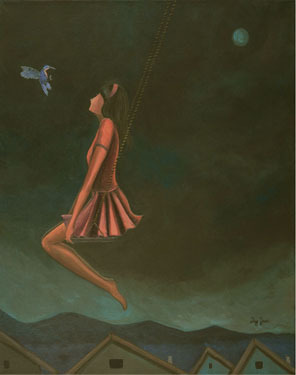 I painted the girl escaping from her reality into the night sky, swinging on a star and wishing her troubles away. She makes the acquaintance of a humming bird which symbolizes joy. I believe that dreams are extremely important in our lives, they help us to escape the blues and teach us to be creative with our minds. When I was a child, I was lonely and dreamt many dreams and those dreams helped me through my loneliness. As an artist the power of dreams is so omnipresent in my life, they serve me so well and effectively that I am forever grateful that I have learned to be a dreamer.